The tahini sauce here is something special. I think of it as an adult version of peanut butter. Note that if you’d rather not make, or eat, the cauliflower fried, you can eat it blanched, with the tahini sauce, and that tastes darn good too. To prepare the cauliflower, core the head by cutting at an angle around the core. Wash the cauliflower, then break off florets, about 2-3 inches in size. Blanch the cauliflower: in a large pot, bring 8 cups of water to boil. Add 3 tablespoons salt (this will give flavor to the cauliflower) and return to boil. Add the cauliflower and cook for three minutes, just until the florets are al dente, stirring once or twice. Drain and spread out on a towel to cool and dry, about 45 minutes. The florets must be completely dry before frying. In a medium pot, heat the oil (1 ½ inches deep) to 375 degrees. 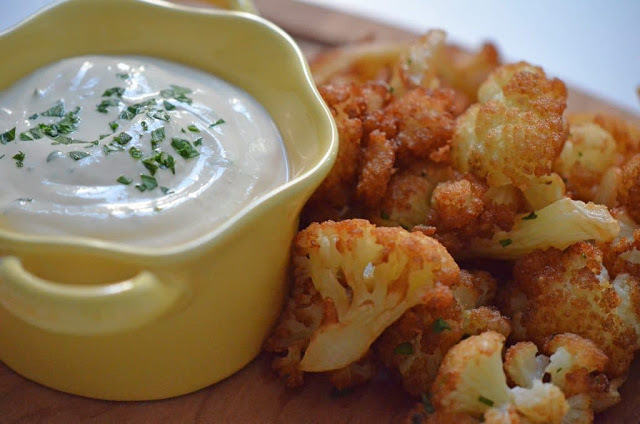 Fry the cauliflower in batches of 5 or 6 at a time. Add the florets to the hot oil, which will bubble up rapidly all around the cauliflower. Fry until crisp and golden brown. Remove with a slotted spoon and place on a paper towel to absorb the oil. Return the oil to 375 degrees again before adding more cauliflower, and be sure to maintain steady heat throughout the frying process. To do this, increase and decrease the burner heat as needed, and remove the pot from the heat as needed as well. Serve immediately with tahini sauce. For the tahini sauce, use a blender or a mini food processor for the lightest texture; hand-mixing in a bowl will work as well. Add the tahini, garlic and salt. With the blade running, slowly add the water and the lemon juice, stopping to scrape the sides and stir as needed. The sauce is similar to the thickness of yogurt, though much lighter. Stir in the parsley. Tahini sauce can be made ahead and refrigerated, covered. A tablespoon of water or lemon juice may need to be added to the tahini sauce once it’s refrigerated, as it will thicken. Keep some tahini sauce on hand as a dip for all kinds of vegetables as well as pita chips. It lasts, covered and refrigerated, about a week if it includes parsley or two weeks without.